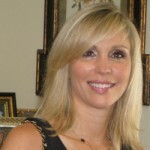 In her groundbreaking books, The Secret Pleasures of Menopause and The Wisdom of Menopause, Dr. Christiane Northrup delivers the message that life has just begun at menopause. Her view is that the “change” is the beginning of a very exciting and fulfilling time, and that it’s not a collection of symptoms to be “fixed,” but a mind/body revolution which brings tremendous opportunity for happiness. My hot flashes, moodiness, night sweats, and insomnia have plagued me for years despite my vegan diet, and they still do post-menopause. I truly believed that if I waited long enough, my symptoms would disappear. Unfortunately, that hasn’t been the case. The sleepless nights, irritability, and hot flashes seem like an endless road to nowhere. 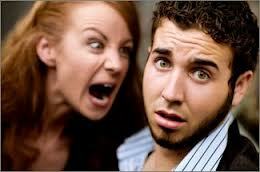 So, what’s a menopausal (or post-menopausal) woman to do? Since I realized it was time to take action, I decided to read more books and search the Internet to find natural ways to alleviate my symptoms. I learned that various herbs such as Black Cohosh, Wild Yam, Ginseng, Gingko biloba and St. John’s Wort, along with exercise and acupuncture can be quite effective in reducing menopausal symptoms. Although I haven’t taken any herbs and am still considering acupuncture, I have had a good deal of success with “sweating it out” at the gym. However, that hasn’t been enough, and I’m not willing to take hormones or pharmaceuticals. Thank goodness, I learned that certain plant foods are very effective for menopausal relief. Yes, it’s true. According to an article in Natural News, phytoestrogens which are found in a variety of foods contain plant-based estrogens called isoflavones. Isoflavones can provide natural relief for women with menopausal symptoms. 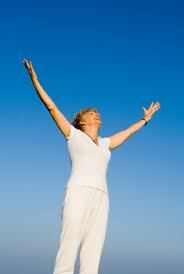 U.S. News & World Report recently reported that menopausal women who lose weight in the context of a healthier diet (ie. a low-fat diet rich in fruits, vegetables, legumes, nuts, and whole grains) could reduce or eliminate their hot flashes and night sweats, according to a large new study. Studies have also suggested that if you eat less fat and more fiber, you’ll keep estrogen levels from fluctuating drastically. So, isn’t it worth giving a healthy plant-based diet a try during this “exciting and fulfilling” time of your life? After all, there is no downside. Although my diet is completely plant-based, I learned that some plant foods are considered superfoods when it comes to relieving the symptoms of menopause. 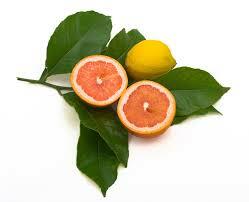 Therefore, I decided to concentrate on these superfoods which are most likely to help relieve my symptoms. According to Dr. Northrup, flaxseeds are the best available source of phytoestrogenic compounds known as lignans– with a concentration more than a hundred times greater than other lignan-containing foods, such as grains, fruits, and vegetables. 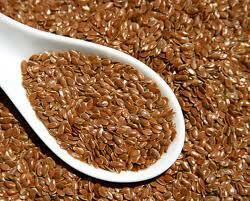 Flaxseed is also an excellent source of fiber and of omega-3 fats. Since studies have shown significant hormonal changes in women who consume flaxseed, ground flaxseeds and flaxseed oil are among the best estrogenic foods for natural menopause treatment. 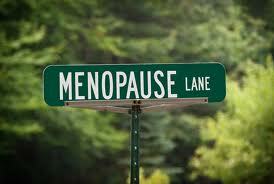 In her book The Wisdom Of Menopause, Dr. Northrup suggests using 1/4 cup ground flaxseed three to seven days a week. Well-known nutritionist Kimberly Snyder reports that fermented soy products such as tempeh, miso and natto contain high amounts of phytoestrogens which help balance hormones during and after menopause and are, therefore, excellent food choices for the relief of menopausal symptoms. 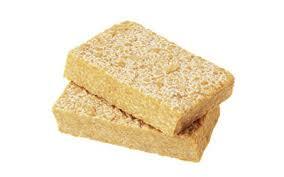 Be sure to only consume organic soy products that contain non-GMO soy. 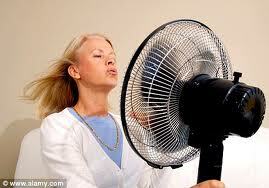 According to Ms. Snyder, Vitamin E has been shown to relieve hot flashes. 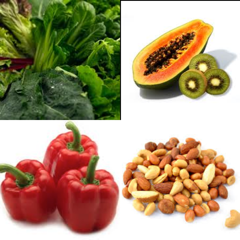 You can increase your Vitamin E intake with dark leafy greens, nuts, tropical fruits (like kiwi and papaya), and red bell peppers. Dr. Northrup states that bioflavonoids compete with excess estrogen for receptor sites and are therefore helpful for balancing menopausal hormones. The white, spongy inner peel of citrus fruits is a very rich source, as are cherries, cranberries, blueberries, bilberries, many whole grains, grape skins, and red clover tea. 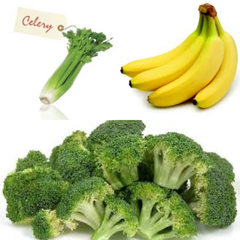 Other great foods for menopausal symptoms are celery for relieving bloating and stress, bananas to aid in fighting off mood swings or depression, and broccoli for staving off osteoporosis and arthritis while removing toxins. It has been suggested in Ayurveda, that cooling, sweet and soothing foods should be eaten to reduce hot flashes, urinary tract infections, and skin problems. 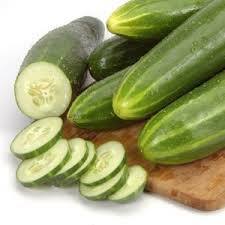 Cooling foods would include cucumbers, grapes, apples, mangoes, melons, squashes, and bitter greens. In this regard, Kimberly Snyder suggests adding cucumber to one of her favorite drinks, the Puerto Rican Glowing Green Smoothie, for more soothing and cooling effects. Blend the water, kale or spinach and sunflower sprouts. Add the papaya and lime, and blend until smooth. Enjoy, and save the rest covered in the fridge for up to two and a half days. Since I spoke about certain foods which may help ease your menopausal symptoms, I thought it would be a good idea to talk about foods to avoid during menopause. Dr. Northrup states in her book The Wisdom Of Menopause that even one cup of coffee in the morning can disrupt sleep at night. Coffee is also a bladder irritant and may cause you to wake up at night to urinate. Dr. Northrup notes that alcohol is a sedative, but it also disrupts the brain-stem sleep mechanism, resulting in rebound insomnia- meaning that you are more apt to awaken in the middle of the night because your body will need more sedative to get back to sleep. 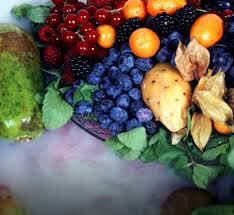 Vegetables, fruits and whole grains are much better choices because they are low in fat and fibrous. Kimberly Snyder says that animal products, including dairy, are acidic and they take calcium out of the bones as the body tries to neutralize the acidity. Furthermore, heavier foods will slow down your digestion, possibly making your discomfort during menopause even worse. Of course, there are other natural ways to change your lifestyle to make your transition easier such as yoga, tai chi and meditation. I intend to concentrate on more of the plant-based superfoods such as flaxseeds, fermented soy products and cooling foods, and to exercise more than I have been. Hopefully, these changes will help me finally put an end to my annoying menopausal symptoms. Stay tuned because I’ll keep you updated on my progress. I think I just fell in love with you! Thank you so much for this article. My copy of Christiane Northrup’s book is in the mail, I’m buying flax seed everything, and so on…I’ll keep you posted. This past month or so has been intense! Let me know how it goes! It’s not easy! A month ago I switched to a vegan diet and I cannot believe how wonderful I felt after just 2 weeks! Ive suffered with hot falshes/night sweats, insomnia for over 10 years & thought I would never get relief..by cutting the “animal” out of my diet I have literally changed my life! Not only do I sleep through the night, but the heat doesnt bother me like before (I live in the southwest, it gets VERY hot here). Now after almost a month Ive adjusted the temperature on my a/c, and many times in the car I dont even run the a/c!!! So amazing! Those hot flashes are killers, so I’m so happy for you that you beat them with your new vegan diet!Thank you for leaving the comment, and for visiting our site! I’m on the internet researching information and came across your site, and wanted so much to share information. I have started a few months ago with memory loss, severe hot flashes (drenching my bed in sweat to the point of showering in the middle of the night and changing sheets) as well as about 50 hot flashes a day. A switch was flipped on with my “change”. It was a total nightmare. My quality of life was affected. 9 days ago, I started an organic, raw vegan diet. I cut out caffeine, sugar, social alcohol. Within 24 hours, I had NO hot flashes. I was in disbelief. 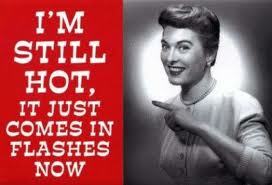 I’ve not had ANY hot flash since. With a raw, vegan organic diet along with cutting out the caffeine and occasional social cocktail, I have transformed my entire body. It is absolutely unbelievable but true. I wish we could get the word out about this, it is a life changer. I will slowly introduce some legumes and things like quinoa but I will definitely stay this way of life. Thank you. You have achieved some incredible results with your diet change, and I applaud you! So smart of you to become educated, and to make the connection between your diet and your menopausal symptoms. Keep up the good work! Yes, we need to get the word out there. I agree, it’s a life changer! When u r premenapausal, do u need more estrogen or progesterone? Hi. You posted this article two years ago I think. I just wondered what the results were in terms of helping with your symptoms? Do you have anything else you have found which helps? Many thanks for your gift of sharing. Since everyone experiences the symptoms differently and for different lengths of time, I’m finding it’s not a one-size fits all solution. Frequent exercise, healthy plant-based eating and finding an alternative medical doctor to talk to really helps! Have your symptoms improved at all? I just found this article which makes soooooooooo much sense to me. I hope it helps.